Pressure Cooker Ribs was one of the first dishes we made in our pressure cookers. The first time Jacky made this pressure cooker ribs recipe, I was out enjoying dinner with my best friends. In the middle of dinner, Jacky texted me a photo of a gorgeous rack of baby back ribs with “You’re totally missing out!” This was unusual. Lately, we had a little fun with some baby back ribs and tested different cooking times to find the perfect time that suits our tastes. Choose your favorite cooking time: Pressure Cooker Baby Back Ribs Cooking Time and make some BBQ Pressure Cooker Ribs! 1. Purchasing Baby Back Ribs: search for ones with even and uniform thickness in the rack. Try to find ones with even marbling. Some of the baby back ribs’ meat flavor will transfer to the liquid when cooking it in the pressure cooker. It only makes sense to place the ribs in the cooking liquid if you are making the sauce in the pressure cooker at the same time. Because all the flavor that has gone into the sauce will be brushed back onto it. However, if you’re discarding the cooking liquid in the pressure cooker afterwards or you’re using an already made/store-bought BBQ sauce, you should place the ribs on a trivet when cooking in the pressure cooker to preserve the flavors. 3. 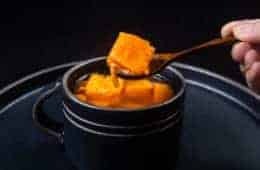 Liquid smoke: be sure to only add a few drops, or else the smoky flavor will overpower the sauce. 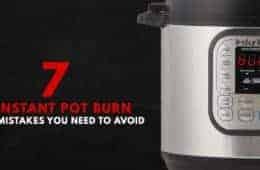 Be careful not to spill the liquid smoke as the smell is not easy to wash off. Make these Pressure Cooker Ribs with homemade dry rub & BBQ sauce in less than an hour. Tender ribs with incredible depths of smoky & sweet flavors. 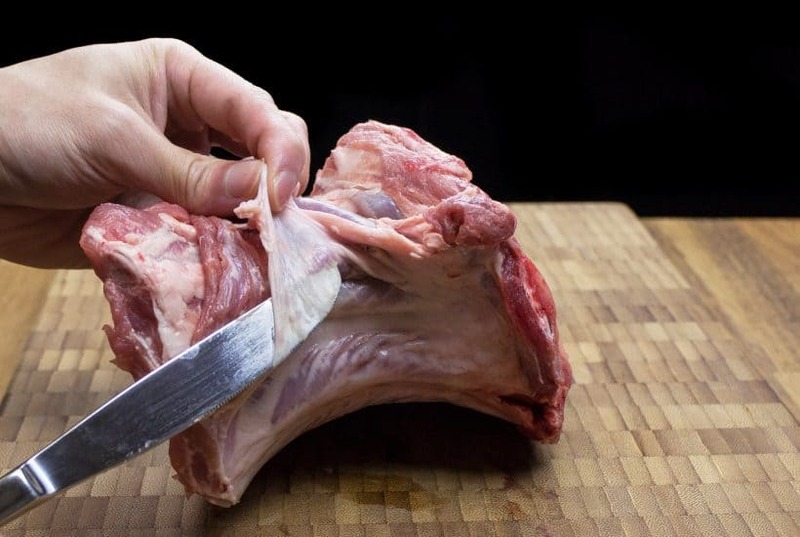 Prepare the Baby Back Ribs: Remove the membrane from the back of the ribs with a butter knife and a paper towel. 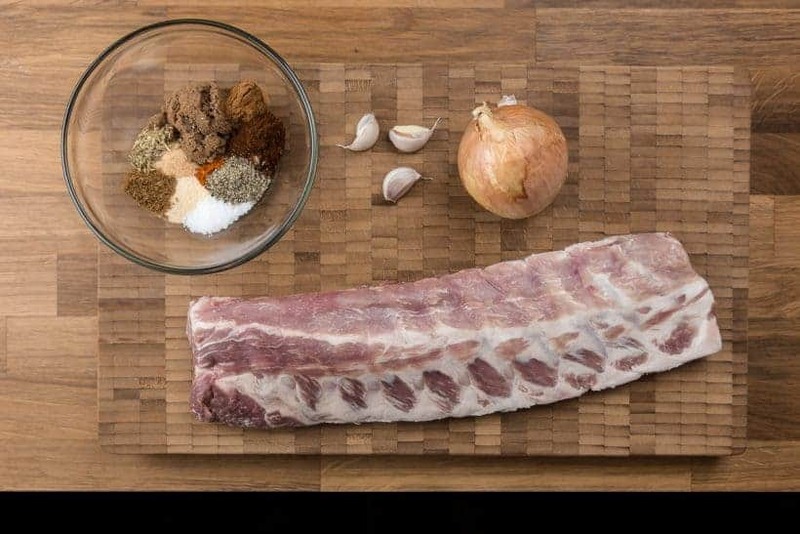 Dry Rub the Baby Back Ribs: Mix all the dry rub ingredients and rub it all over the baby back ribs. Then, set aside while you prepare other ingredients. Pressure Cook the Baby Back Ribs: Pour the homemade BBQ sauce into the pressure cooker. Add 2 – 3 drops of liquid smoke into the BBQ sauce. Place the baby back ribs into the BBQ sauce (See Tips in the post). Close lid and pressure cook at High Pressure for 16 – 25 minutes. Adjust your cooking time according to your preference: 16 minutes (tender with a bit of chew) to 25 minutes (fall off the bone). Turn off the heat and full Natural Release. Open the lid carefully. Preheat the Oven: While the baby back ribs is cooking in the pressure cooker, preheat the oven to 450F. 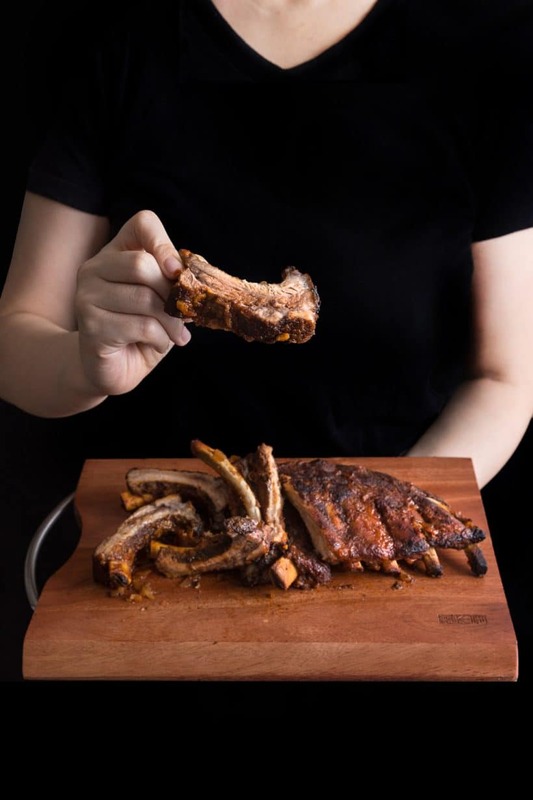 Set Aside the Baby Back Ribs: Carefully place the cooked baby back ribs on a chopping board with kitchen tongs. Cover it with aluminum foil and set aside. Filter the Fat (Optional Step): Filter the BBQ sauce with a strainer and remove the fat with an oil separator. Reduce the BBQ sauce: Place roughly chopped carrots into the BBQ sauce and bring your BBQ sauce to a simmer. 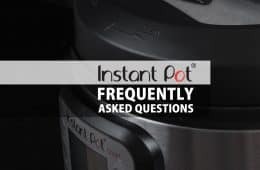 (Instant Pot: Click sauté button once and click on adjust button twice to get to the Saute Less Function) Continue to reduce and thicken the BBQ sauce by simmering until desired thickness (roughly 6 - 8 minutes). Occasionally, stir with a wooden spoon. Taste the seasoning of the BBQ sauce. Stir in more brown sugar and additional 1 – 2 drops of liquid smoke if necessary. Apply Sauce and Finish in the Oven or Grill: Brush the homemade BBQ sauce all over the baby back ribs on all sides including the bones with a silicone basting brush. Place the baby back ribs in the oven on the top rack for 10 – 15 minutes. Serve and Enjoy: Serve the baby back ribs immediately with more homemade BBQ sauce along with the carrots. These were aaaaamzazing!! Def will make again! I’d give it 5stars but site won’t let me! Hi, I’m getting ready to use this recipe to grill tonight! One question… if we are grilling it, do we need to place the ribs on a foil? What is the recommended temperature? Would you recommend the grilling time to be similar to the time spent in the oven? Apologies ahead of time if the questions were repeated already..
Not long. You just want to caramelize the BBQ sauce a bit to give it more flavor. Highest direct heat over the shortest period of time will work the best. I have enjoyed cooking these three times now. Twice they were flawless, but this last time the meat was dry and didn’t fall apart like before. 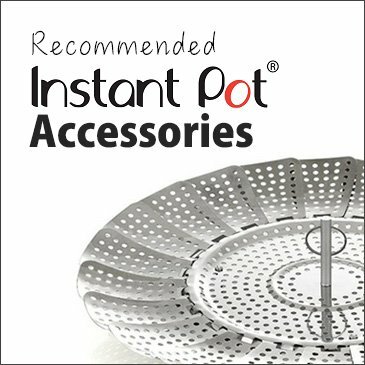 Could this be too much time in the InstantPot? Or too little? 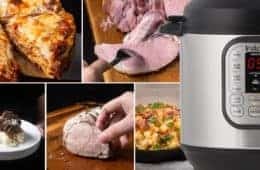 Would the meat improve if I put it back in the pressure for a short amount of time? If nothing was changed, it was properly because of the meat quality. This particular piece may not have been fatty enough. The cooking instructions were fine and the ribs were nicely done, but I thought the fennel was too pronounced. I’m wondering if it might be because I ground my own fennel seeds since I couldn’t find ground fennel in any of our three local grocery stores? It could be as freshly grounded seeds are more flavorful. By putting the carrots in at the end as the sauce thickens are they still hard after the 6-8 minutes or will they soften? Thanks! I’ve tried many of your recipes and love them. If they are not too thick, it will soften in roughly 8 minutes. All set up and burn notice. Any thoughts on why or how to prevent this? Thank you for your question. The newer models are more sensitive with the burn notice. The best way to prevent the burn notice is to layer the thicker ingredients (e.g dijon mustard, ketchup..etc) on top and avoid mixing them in. This was our New Year’s Eve meal. Another delicious recipe!! 4 stars, only because they are not as good as my husbands, which take 2 days and a lot of fuss to make. Thank you! How long does the natural release take? the natural release will be roughly 15 – 18 minutes. You can release the rest of the pressure if it doesn’t fully release in 20 minutes. I have pork loin backribs, are there these the same as baby back ribs? If not, are there any adjustments to the cooking instructions. I have 3 sections but I don’t think they will all fit in my 6 qt ultra so I think I will need to cook in 2 batches. Thank you for your assistance and the wonderful recipes. Loin back ribs are the same as baby back ribs. 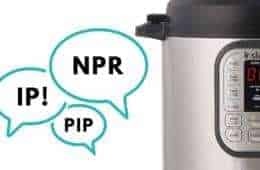 Amazon delivered my new Instant Pot Duo Plus 8qt yesterday. With this purchase, my only goal with was to produce “fall-off the bone” baby back ribs. My family luvs ribs and for years, I’ve tried to achieve restaurant quality ribs. I’ve tried a multiple of oven recipes, bbq recipes, slow cooker recipes, three stage recipes, all with marginal results. My fall back was to purchase frozen, commercially prepared ribs and everyone knew where they came from! Well that’s all history! I made 2 racks, following your recipe, but oven coated them with Sweet Baby Ray’s Original BBQ sauce. I ate 1/2 rack testing them, they were “fall-off the bone” delicious. Thank you for all the recipes, can’t wait to venture beyond ribs!! BTW… 4 different “rib people” have had my ribs and all loved them and could not believe the ease of preparing them.. Total winner!!! I am happy to hear you enjoyed this made from scratch version!! thank you so much for sharing this beautiful story with us. So happy to hear your wife and your sister enjoyed it as well! These are now my go to and my specialty secret recipe! Thank you for this incredible recipe. The only think I add in is some grape or raspberry jam 😉 but killer recipe without. Highly reccomend, and we are asked to make these any time I have company over. I am intrigued by the additional of grape or raspberry jam!! I will be trying it next time I make ribs. Is it necessary to remove the membrane on the back of the ribs? I never used to take it off when I simmered them for ages prior to broiling them for a bit with barbecue sauce and they were fine…? It is fine to leave the membrane on, but it works better with it off. It will depend on the size and thickness of the meat. I would say roughly 28 – 32 minutes. Our favorite rib recip, we have made them probably 25 times now. Perfection every time! Thank you for your detailed, science-based recipes. I have learned so much from you, and everything has been delicious! Thank you so much for your kind words and using the recipes!! Love your rib recipe! I’ve made this several times now in my 3 qt pot. I have a question about making 2 racks at the same time in the 6qt. Do you recommend it and how long should I set the pressure for? I like a little texture and usual do 1 rack for 22″. Thanks so much! The cooking time will be mostly the same. You may want to reduce it by a minute due to the longer get up to pressure time. My family really loves the Bbq sauce this recipe makes and they want extra sauce for dipping basically everything. I doubled the sauce amount, should I decrease cook time by 2 minutes or so to account for the additional bring up to pressure. Yes, that will be the best way I can think of! I can only say, thank you, thank you, and awesome. I made enough for my wife and I. We both wish we had more. First time I made ribs in a pressure cooker. We loved it. Enough said, anyone reading this, give it a try, it is well worth it. Thank you both for taking the time to share it with us. You made our night. Your comment made our night as well! Just wanted to say, I love these ribs! I’ve made them twice now, each time – perfect. I had my partners’ parents over for dinner and they were super impressed! These ribs are pretty straightfoward to make and taste absolutely authentic, as if I’m in the South of the USA. Thanks so much for putting this recipe together. I’ve slowly tried most of the other recipes on your site but this is my favourite! Cheers to many more yummy meals to come! 🙂 Wish you & your family an amazing year ahead! Aloha Amy, thank you for the recipe. I’m looking forward to giving it a try. What do I do if I want to use my own BBQ sauce? Do I put a cup of water on the bottom of the pressure cooker? I plan to put the ribs on a trivet. Thank you! If the BBQ sauce is already made, this recipe will work better. All your recipes are amazing. I’ll be making these Christmas Eve! Merry Christmas to Everyone! Thank you so much for this terrific recipe! It is one of the first things I made in our Instant Pot, and the ribs were so delicious that I keep thinking about them! I love how your recipe makes the BBQ sauce at the same time — so easy and so yummy. I fit 2 racks of ribs into my Instant Pot, and it worked out perfectly. Your descriptions and directions are easy to follow — I also made your Thai Green Chicken Curry and it is also a winner! Many, many thanks. So happy to hear from you Diana! Excited to try this! Just had a quick question – should I use the broil setting on my oven for the last step? If so, should it be on “high” or “low”? Thanks! It should be on the highest setting to caramelize the ribs as quickly as possible (without drying the moisture inside the meat). Hi Amy + Jacky, When you say “Turn off the heat and full Natural Release”, do you mean to hit the cancel button once the timer is finished, and let it naturally released until the valve drops? Or allow it to naturally released (timer counting up) without doing anything so it essence pressure is dropping while it goes into warm mode. I have an Ultra and have always let it npr without hitting the cancel button so I wasn’t sure of this line of instruction. Both ways will work as the keep warm mode will not kick in until the temperature drops below ~158F (70C). 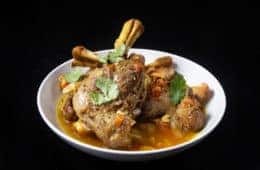 Can you use beef ribs for this recipe? Yes it will work. If you are using thick cut of beef ribs, it will take 35 – 40 minutes. Wow. These were so delicious! The rub and homemade sauce are worth the extra effort. Whole family loved them! So happy to hear your family liked the recipe! I’m going to attempt this next week. When I double the amount of meat to two racks, I saw a comment advises not to double the sauce. How would double the meat affect the cooking time, both in the IP and in the oven? Doubling the meat will increase the get up to pressure time by about 4 – 5 minutes so I would decrease the pressure cooking time by 1 minute. There will be no effect on the oven cooking step. Neat. One other question that’s come up is to do with the oven step. It says to preheat the oven, and then later place the ribs on the top rack. Do we preheat under bake or broil setting? basically, should the ribs be closest or furthest from the heat? Lastly, I assume we bake them uncovered by foil. It should be closest to the heat. The idea is to caramelize it in the shortest time to retain the moisture in the ribs. Some toaster ovens don’t have a broil setting hence the preheating step. How long should the natural release take? Mine stayed locked for another 20 minutes and the ribs seemed somewhat overdone. Again the cinnamon?! (Like your amazing pulled pork.) Deeeelish! So flavourful and tender. Fall off the bone finger-licking good. Thanks for the recipe Amy and Jack! Trying the pork carnitas next (with cinnamon ;-)! Cinnamon is a great match with pork. Have fun making the Pork carnitas! Hi – I have to prepare the ribs a day in advance. Do you think it would work to pressure cook the ribs, stick them in the refrigerator overnight, and then baste and finish in the oven the next day? Thanks! Yes, it will work, but the ribs will not be as moist. Some of the moisture/juice will evaporate while in the refrigerator. It should still be good enough to serve! Hi! Its me again. I just asked if you could use your own rub and BBQ sauce. I made your recipe before and they turned out tender and all but my father didn’t really care for the rub flavor but I did. That link you sent me. Will that change how they came out, like all tender and fall off the bone? I want that same texture with my own rub and BBQ sauce. Is there something in the rub/BBQ that makes it tender? The dry rub is for flavor so this version will also come out all tender and fall off the bone. Can I use my own store-bought BBQ sauce and rub? Would I have to do something different? these are absolutely delish! can I use the rub on the the easy chicken wings? Yes, it will also work for chicken wings. Thanks for such reliable, thoroughly tested and clearly written recipes! I am looking forward to trying many more. Hi! I love this recipe and have made it many times. But now I have St. Louis style ribs. Does the cooking time change at all? Thanks so much!! It will take about 25 – 30 minutes + Natural release. I’ve been using the IP for baby back ribs a lot. My husband loves them. I use a purchased, favorite rub and cook them on the trivet over apple cider. I usually cook them about 30 minutes. QPR and I then put our favorite BBQ sauce on them and put them in the broiler. I did put them on the grill one time but, prefer them from the broiler. I found we can do the same with chicken quarters. About 25 minutes, QPR, slather with sauce and grill or broil to carmalize. Very, very good. The BBQ chicken quarters sound so yummy. Thank you for sharing your cooking experience with us! QPR is quick pressure release. So happy to hear the IP & Smoker cooking method works. Thank you so much for letting us know. Let us know if you come across any questions with your new pressure cooker. I usually smoke my baby back ribs but this weekend I would like to combine I P and smoking for cooking ribs. I am thinking I P for 18min and after 1 hour smoking at 220F. Would that work to infuse a smoke and tender ribs . I haven’t done it the way you method so I am just guessing here. Smoking the ribs for 1 hour may just be enough as I usually use 2-1-1 or 2-2-1 for baby back ribs! Hi! Excited to try this recipe. I want to use the dry rub but will use store bought BBQ sauce. What liquid should I put in the pot and what quantity? I would use 1 cup of cold water and place the ribs on a trivet to keep it away from water. could you kindly let me know which brand of liquid smoke you used? The link seems broken so I can’t check it that way. We use the Wright’s Hickory Liquid Smoke. When doing more than 1 slab of ribs and increasing the ingredients would you also increase the liquid smoke amount, since it says to be careful with it so it’s not too smokey? The BBQ sauce & liquid ingredients don’t have to be increased for 2 racks of ribs. I forgot to grind the seeds so I put the entire dry rub mix in our magic bullet and blended all the dry rub ingredients to almost a powder which seemed to help the mix penetrate the rib meat. The best baby backs I have prepared in the I-pot yet!! Used my own BBQ sauce (Sweet Baby Rays). Pressure cooked them for 21 mins in 1 cup of water, threw in some red onions, a tsp of minced garlic, splash of ketchup and a splash of cider vinegar and finished off on a gas grill. I think 21 mins in the PC was perfect (not quite fall off the bone) so they were easier to handle when it came time to grill. Thanks for your posts and keep up the good work! Hi. As a follow up to your response to Dora above re. 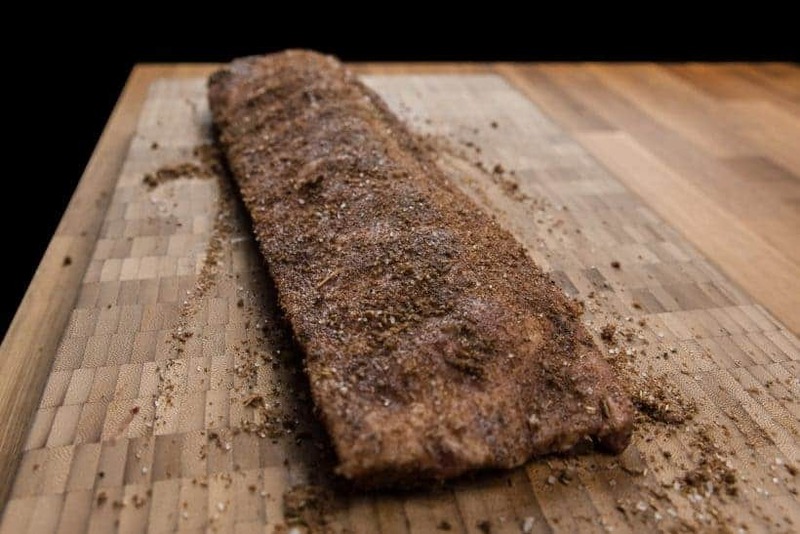 using a bottled bbq sauce and using your easy IP ribs method, would I still be able to use the rub used in this recipe? It’s a tiny detail but I just want to be sure. Thank you! You can use the rub in this recipe with easy IP method! The ribs were so flavorful and so were the carrots…the carrots made the perfect symbiotic relationship…they flavored the sauce, and they took on that honey deliciousness from the sauce. Perfect! And we had enough for another meal! Yummy! ??? Thank you for the feedback. We are so happy to hear both of you enjoyed the ribs and carrots!! We love the carrots and the sauce too! Our rating system is buggy for some users. I have changed the star rating for you! Not sure what happened but I followed the directions and the smell coming from the pressure cooker wasn’t delicious. When I opened it up the sauce had completely burnt in the bottom of pan. Such a bummer. 1) The silicone ring was not seated properly. 2) The venting knob was on the venting position instead of the sealing position. 3) This one is most likely what happened. The liquid was too thick for the pressure cooker to generate enough steam to get up to pressure. The measurement of the liquid ingredients may have been off or the ketchup used were particularly thick. To avoid this, I would suggest layering the ketchup on top of everything and not mix it in. Excited to make ribs in my IP tonight. Can I cook two racks? There seems to be enough space. My family makes this dish called percatelli. It is a tomato sauce based recipe with a rack of ribs cut into thirds long wise. I’m trying to convert it to the instant pot. If I were to convert it would the time be the same since it’s a rack of ribs, just cut oddly? I recently made these delicious ribs. They were fall off the bone tender. It was a fun and tasty recipe to follow. I love your site. The recipes I tried are now in my regular rotation. Thanks for this detailed recipe. Any suggestions for “roasting” a small turkey in the IP? The oven is a better tool for roasting a small turkey or whole chicken as the dark meat and white meat need different cooking time and temperature. We still haven’t found a reliable method to replicate that in the pressure cooker. I never made ribs using pressure cooker and I use pressure cooker to make my beans all the time!! It looks delicious!! We love making ribs in pressure cooker! My mom adores ribs and I’m not too thrilled about making them (just because I never get them just right) but this is a brilliant way to cook a tender and juicy batch up! 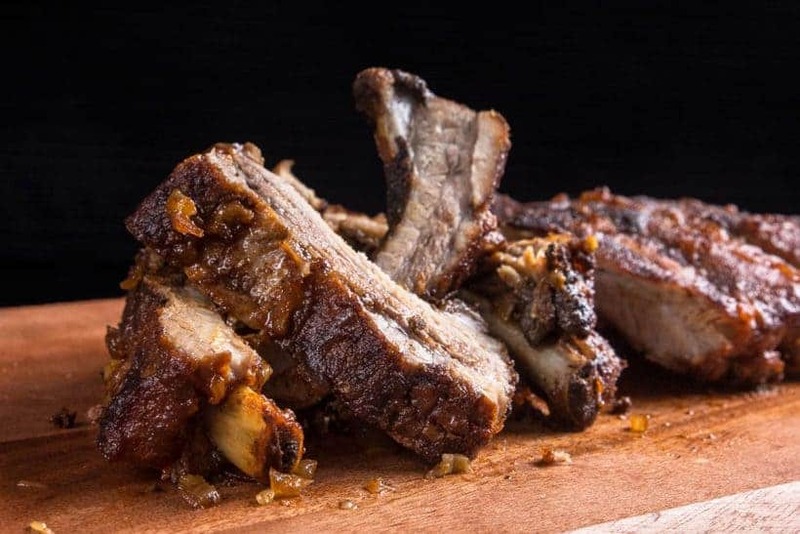 Try this method of cooking ribs in pressure cooker. I don’t have a pressure cooker. I got a slow cooker recently and I honk my husband would kill me if I even started talking about getting a pressure cooker. But oh man, this early ribs make me want to get it. And I love the video! hehe~ I feel you Julia! Enjoy your new slow cooker! I’ve never used a pressure cooker before, will have to look into it, they’ve always scared me a bit!! Try it sometime if you get a chance to! The modern day pressure cookers are very safe and easy to use. If I want to cook regular spare ribs instead of babyback ribs, do you think the 16-25 min would still be ok? Spare ribs may take a bit more time than Babyback ribs. I would aim for 20 – 30 minutes. I just tried this with a rack of spare ribs without adjusting the recipe/cooking time. Even at 20 minutes a lot of the inside was uncooked. I would recommend at least 25 minutes, probably closer to 30-40 to be safe. Made this a couple weeks ago and they are so delicious! I’m trying it again tonight, but wondering if I need to have so much liquid ingredients. I had way to much sauce last time and I think I’ll probably use a bottle barbecue sauce this time anyways. Could I cut back on the liquid ingredients? Thanks! Hope you will like our Pressure Cooker Ribs recipe! PS the ribs look tasty! ?